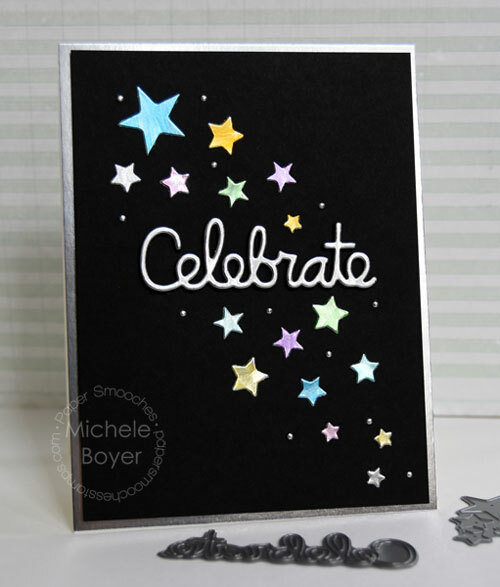 I first die-cut the word Celebrate several times from black card stock then once from silver foil card stock. I layered all then adhered to the center of the black panel. 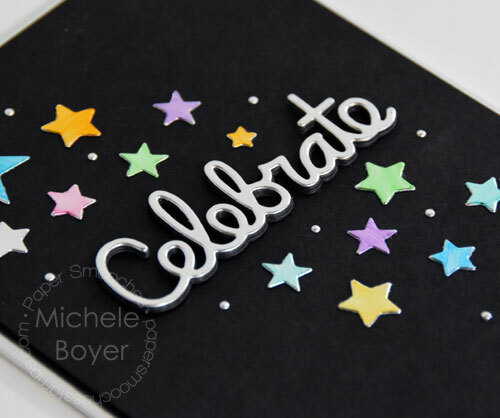 I die-cut the stars from silver foil as well then colored most with Copic markers. When I looked closely at the foil paper, I could see very slight directional lines (grain) so I colored in the direction of the lines and that way, the added color was pretty smooth. To create the tiny dots, I die-cut a scrap of silver foil using the Stitched Square die. The dots are the perfect little accents, I think! Once the panel was assembled, I adhered it to a silver foil panel and then to a card base. That’s a wonderful card !! I love the black base that does half of the job ! !